Abstract: Istanbul’s complex love story with smoking began around the year 1600. It was at this time, Ottoman authors note, when coffeehouses, shops, and even streets and mosques of Istanbul came to be covered under the smoke of “the English leaf,” as tobacco was commonly referred to. The appearance of tobacco coincided with, and quickly became part of, a series of heated debates on public morality. Specifically, what was at stake was the limits to intervention in public affairs by political and religious authorities. Tobacco became a symbol for many of these concerns with its connection to unruly social groups and spaces. Ottoman debates on tobacco often linked its consumption with coffeehouses, urban Sufi groups, and janissaries. The eventual legalization of tobacco is often credited to janissaries, merchants, and other non-religious consumers, while Sunni religious authorities are assumed to support the state’s harsh regulation of tobacco, and together with it, of the coffeehouse public. This paper focuses on protests against the tobacco bans by religious authorities – namely Sufis, ‘ulama, and preachers. A close reading of anti-ban tracts by these authorities reveals that political intervention in tobacco consumption was considered a violation of the public-private boundary which identified the limits of public authority. More important, the Ottoman debate differed from the medieval Islamic precepts on which it was fundamentally based. Medieval debates on the limits of the muhtasib (marketplace inspector)’s interference by and large presupposed that anywhere but the home could be the sphere of legal intervention. Yet, some Ottoman ‘ulamā advocated non-intervention not only in the private sphere, but also in practices pertaining to the public sphere – such as smoking and coffeehouse sociability. This paper places tobacco debates within a larger debate on early modern innovations and non-intervention. These debates paved the way for the emergence of the public as an arena of free association and moral authority, delimiting the scope of legal-political surveillance. 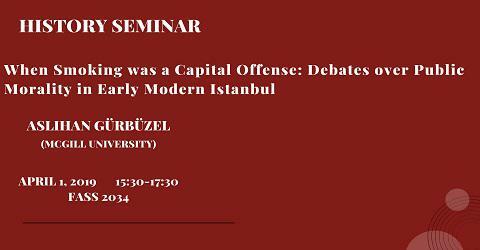 Dr. Aslıhan Gürbüzel is Post-Doctoral Fellow at the Koç University Research Center for Anatolian Civilizations (ANAMED) and Assistant Professor of Ottoman Studies at the Institute of Islamic Studies, McGill University. Her research focuses on Ottoman Sufi networks in the seventeenth century and their contribution to the formation of a political public. She is further interested in literacy and manuscript production in urban Sufi circles, and autobiographical writing among Ottoman ʿulamā.